The importance of a good website cannot be overstated. When people hear about something for the first time, they always do the same thing: they go to the internet to research! So when someone hears about you and your company for the first time, what do they find about you? Our goal at NetStuffers is to make website development not only easy, but also affordable. We will match our web services to best meet your needs and your budget so can get up and running and focused on customer sales. For small businesses, we offer a number of payment plans to help you launch your website without incurring a large, up front expense. Find out more by contacting us for a free website quote. 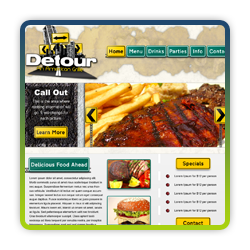 Over the years, NetStuffers has partnered with a number of restaurants and bars to create websites that enhance their brand and help draw in customers. Our bar and restaurant websites come with a content management system and customer support to ensure the website runs smoothly. For more information, please visit our websites for bars and restaurants information page.